I've always been apprehensive about eReaders. I thought they were 'soulless' machines unable to offer readers the depth of pleasure that the physical aspect of holding a paperback or hardback provides. Who wants to stare at a grey screen which takes away about one third of the reading experience: the aesthetic pleasure. The feel of paper, that shiny cover, and the scent of the pages? But a few months ago I opted for an affordable, and gloriously hot pink, Sony Reader solely for the purpose of reading eBook review copies sent by authors and publishers Sure, it took away the strain of having to read hundreds of pages on an LCD screen, but beyond that I wasn't impressed. There was no wifi so everytime I wanted to transfer something I'd have to connect it to the computer. There was also no way to drag-and-drop files onto the eReader directly because Sony make you download their special software. And this, rather stupidly, can only be authorised for use on one computer. The times that I bought an eBook out of pure intrigue from Waterstones.com or downloaded something from NetGalley, it took me at least fifteen minutes each time to get it transferred onto the Sony software because of its complex nature. The eReader itself was also uninviting – turning a page consisted of at least a two second delay and a sudden black-and-white flash, fonts on PDF files would be different sizes and different styles on each page, the screen was dim and very small. Ultimately, it did very little to change my opinion or my buying habits. Then, three weeks ago and on a complete whim, came along Kindle! I think it's now fair to say that my Kindle has converted me to the eBook realm. When I compare it to the Sony, it's blatantly obvious that so much more effort has gone into the Kindle's hardware and software design. Ergonomically, it's a dream. The page-turn buttons on either side of the Kindle and ability to change the screen orientation make it so that you can feel comfortable holding onto it in just about whatever position you're reading in. Font sizes and styles can be changed easily, page turning is fast and flashing is limited. Plus, it's slim and lightweight, and the size and colour of the screen are perfect. Well, okay, so I'd prefer it if the cover art could be displayed in colour, but other than that I have very little to complain about! And could the Kindle store be any better? The selection is so immense! I love that there are thousands of books you can download for free, including classics like Pride and Prejudice and Treasure Island. Then there are the daily deals, the hundreds of newspapers and magazines from all around the world, 99p books, the ability to preview the first chapter before committing to a purchase, etc. All downloaded so simply via a one-click wireless connection! Though I won't be purchasing all my books electronically in the future, I can see myself buying less physical books – especially if I can get the same book for the same price. Having said that, if there's a book that I have enjoyed particularly, I'm still going to have to buy the paperback version. Sometimes I just don't feel I own enough of a book if it's not sitting on my shelf! Is anybody else like that? Also, some of the eBook prices I just don't understand – why do some of them still cost £8 even though you're not paying for something printed? That can't really be justified (unless someone can enlighten me). We'll see. 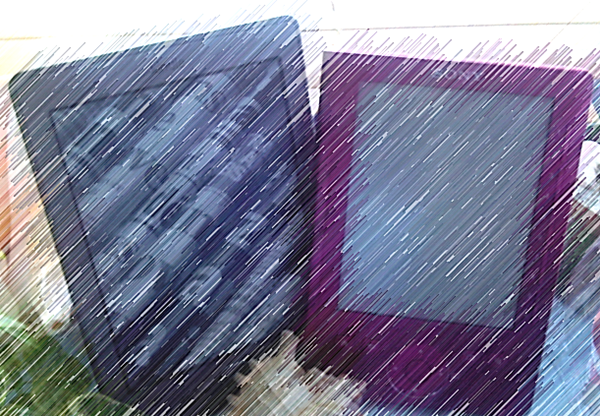 Perhaps my Kindle 'new toy' enthusiasm will waver in another few weeks. But I think it's safe to say that Amazon have done a bloody good job with this one! What are your thoughts about eReaders? Do you own a Kindle or another device? How have your book buying habits changed?